Comfortable Signature UGG® style for the kids! Made from the highest quality sheepskin suede. UGGpure™ lining and footbed for all-day breathability and cushioned comfort. Easy on and off that kids can do themselves. You'll never have a problem getting them to put their shoes on again! Complete your cold-weather look with these awesome accessories! Real sheep fur or lamb has been artificially dyed and treated. Fur origin: Australia, European Union or United States. Measurements: Heel Height: 1 in Weight: 5.8 oz Circumference: 9 1⁄2 in Shaft: 6 in Platform Height: 1⁄2 in Product measurements were taken using size 8 Toddler, width M. Please note that measurements may vary by size. 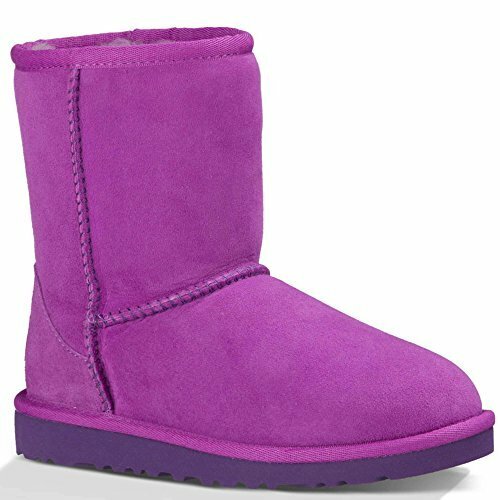 Comfortable Signature UGG® style for the kids! UGGpure™ lining and footbed for all-day breathability and cushioned comfort.